Notice how the notches from the drive wheel gradually fade out over about 10 mm, whereupon the filament expands to fill the PTFE tube. You can’t see the shallow depression from an air pocket offscreen at about 30 mm, but it suggests the filament isn’t quite molten from 20 mm onward. 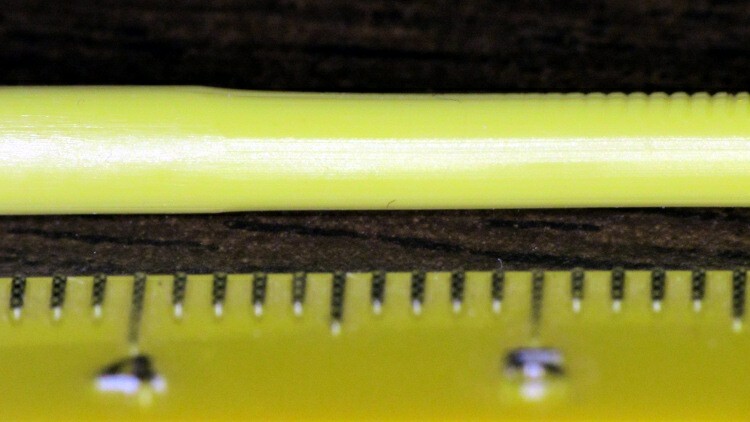 Given that the distance from the nozzle tip to the top of the Thermal Core is about 40 mm, all this makes sense, particularly when you figure the filament was stationary as the Core cooled off after the last print: the melted-to-melty sections are inside the Core and the softened section is just above the Core. In round numbers, the Thermal Core supplies enough heat through the PTFE tube to fully melt the filament for about 20 mm above the nozzle when printing at 2 rev/min. The effective drive diameter is 9.6 mm, so 1 rev = 9.6 π = 30 mm and the Core must melt 60 mm/min = 1 mm/s. This is obviously a grossly nonlinear situation, but if you get only 20 mm of molten filament at 1 mm/s, the maximum speed can’t be much more than 4 mm/s or so. The rest of the Thing-O-Matic’s mechanics set an upper limit for, say, printed octopi at 80 mm/s and 4 rev/min = 2 mm/s, but the extruder will definitely be the limiting factor for speeds over, say, 150 mm/s. Not much risk of that happening here, I’d say. That’s somewhat smaller than the 3 mm of pushback I’ve seen when swapping filaments in mid-print, but it’s in the right ballpark.